GORILLAdigital senior management has been involved in At-Risk Youth issues for more than three years and through our involvement in this area have come to appreciate the enormous positive impact that Career & Technical Education Programs have on at-risk youth. CTE programs, or linked learning programs have demonstrated to deliver higher school attendance rates, higher graduation rates and provide higher income jobs for high school graduates. This is the kind of hope that many students need to keep them on the beam and in school. GORILLAdigital wants to contribute in a meaningful way to the success of CTE programs, so for every school district that standardizes on GORILLAdigital Optics for a two-year period, GORILLAdigital will provide a commensurate level of business partnership development services at no charge. Recruit businesses to provide job shadowing, internships, guest speakers, facility tours, etc. GORILLAdigital was founded in 2000 as a company dedicated to advancing an appropriate use of edtech in classrooms while saving schools money. The company has assisted name brand leaders in the edtech field develop rugged products that incorporate physical security; GORILLAdigital has also partnered with school districts to design edtech products for classrooms and the company provides pro-bono and paid advisory services to schools as well. GORILLAdigital is passionate about early childhood education and the education of at-risk youth. Senior management in the company personally participate in several volunteer programs to help support these important aspects of our education system. In 1998, while working in the edtech field, GORILLAdigital’s founder, Christopher Meyer, noticed that Los Angeles Unified School District was buying a large number of Apple G3 All-In-One computers. This G3 was a school favorite because the software was intuitive and the monitor & CPU were integrated into one unit. The only problem was the G3 had a handle on the top, so large school districts, that needed many computers, had to spend more than $180 per G3 to keep them from being stolen. Chris heard that Steve Jobs monitored emails sent to ‘iceo@apple.com”, so he sent an email suggesting Apple build a security interface into chassis that would help schools lock down Apple computers for far less money. Two weeks later, Chris found himself in the Jim & Tammy Fae Baker Conference Room at Apple with Jony Ive, the designer of the iMac. Jony showed Chris the lower third portion of the iMac which was about half the size of the G3 All-In-One and looked sleek. Over a two week period, ideas were exchanged and the first fully integrated security feature was built into a computer chassis that brought the cost of securing an iMac from $180 down to $30. Not an earth shattering accomplishment, but based on a conservative estimate of one million iMacs a year shipping into schools that needed physical security from 1999-2005, this little project saved schools more than $150 million a year or $900 million over the 6 year period. Chris also played a small role in the early days of Dellware’s Lock & Loaded program which promoted physical security solutions for PCs, monitors and laptops. GORILLAdigital is the first company to patent an education multimedia cart. 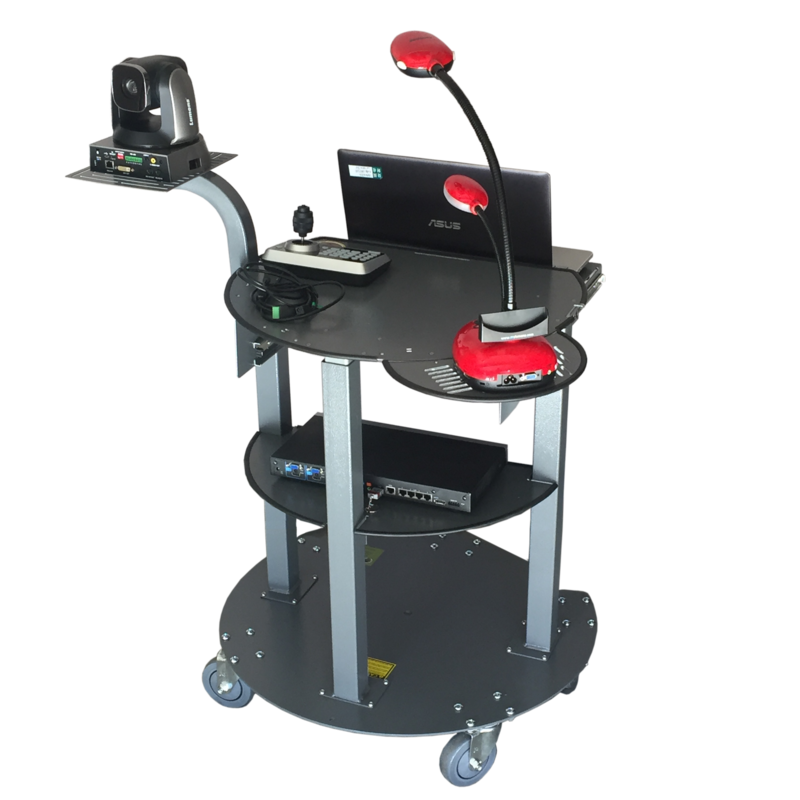 The KONGcart features physical security for most any device along with ergonomic mounting designed to make teaching with technology a breeze. Principals use KONGcarts with projectors, tablets or doc cameras, laptops and speakers to help set-up make shift classrooms/presentations anywhere on campus, for in-service days, movie nights, and open houses. The open architecture and lock down features mean devices on the KONGcart can be moved anywhere and are always ready. In October, the company will introduce a new Sound Cart to help amplify teachers’ voices and enhance learning anywhere, anytime. KONGcarts’ combination of security & ergonomics provides a realistic alternative to costly ceiling mounted AV equipment and this saves our K12 customers’ budgets in a big way. When tablets made their way into schools, GORILLAdigital designed a steel & die cast MONKEYmount that helps leverage tablet’s camera so it can operate like a document camera. Santa Barbara & Palm Springs school districts opted in favor of MONKEYmounts instead of document cameras in over 1200 classrooms, saving a good deal of budget resources. GORILLAdigital helps schools seeking to protect valuable technology devices. We are happy to serve as a sounding board and provide whatever advice we can via email, phone or social media. We value your mission of educating our young and want to help schools plan for the deployment of valuable edtech equipment. So if you have a tricky device to secure, mount or protect, let us know about it, we’ll do our best to help. Lecture Capture is trending in educational institutions as the ability to record and play-back important instructional material benefits student and teacher alike. As lecture capture proliferates, the ability to make the hardware devices mobile and secure becomes an integral part of the solution. One set of Lecture Capture equipment can be moved from room to room, making a school’s investment stretch as far as possible and create a larger impact. While each device is locked down, it is surprising the level to which each piece of equipment is positioned at the user’s finger tips and remains very easy to use. The brain trust behind GORILLAdigital got their start with AnchorPad, the pioneer of computer security for schools dating back to 1972. AnchorPad designed the first lock down device for the IBM Selectric, it was a 20” x 20” die cast hunk of steel that weighed 40 lbs. and grabbed the Selectric so a tractor couldn’t move it. Very effective, however, GORILLAdigital set out in 2000 to design products with physical security that was hardly detectable, our goal was to protect valuable technology without making it look like Fort Knox. GORILLAdigital’s KONGcart has been proven to protect school equipment, with over 5,000 in place protecting a mix of lcd projectors, document cameras, speakers and laptops, no instance of a school loosing equipment to theft or accidental damage has occurred. In fact, one district customer had a series of summer smash and grabs in three schools, but the vandals were not able to remove the equipment installed on KONGcarts. Garden Grove Unified School District had a challenge: how to refresh aging edtech equipment in more than 50 elementary & middle schools without breaking their budget. The answer came in the form of a KONGcart Bundle consisting of the KONGcart – a secure multimedia cart, a projector, document camera, speaker, and laptop. As the KONGcart Bundles were rolled-out in the schools; principals, teachers, and administrators gave them raving reviews for their ease of use, superior security features, and durability. In 2009, GORILLAdigital sought to re-design the av cart or multimedia cart to put today’s edtech equipment within easy reach of teachers while locking the value devices down to prevent theft or accidental damage. In the process, the company created the best projector mount in the industry, one that secures and provides ultimate adjustment options. See more than 50 teacher testimonials from Garden Grove schools to learn just how functional the KONGcart projector mount is. To find out how GORILLAdigital saved this school district more than $600,000 and made schools happy contact us at info@goapedigital.com today. GORILLAdigital provides a comprehensive AV presentation solution for schools consisting of a Laser LED projector, a US-made 30W sound system, & univ tablet stand that makes the iPad work like a document camera all securely mounted on a patented, height adjustable, and mobile KONGcart. After installing more than 4000 KONGcarts in schools, our company decided to select the equipment we think is best suited for schools and offer a complete, turn-key solution. Our Bundle partners include Casio, a world leader in laser led projectors that recently announced a light source guarantee of 10,000 hours (5-7 years of daily use); and Anchor Audio which provides a 30W system that is made in the USA and comes with a 6 year guarantee. The KONGcart Bundle is an appropriate and scalable presentation solution for schools that can replace Interactive White Boards, compliment a large-format touch screen approach, or serve as a campus-wide utility player for digital presentations. Cost and convenience factors make the KONGcart Bundle ideal for K12 schools with limited budgets and scant resources to manage complicated installation projects. Blended learning classrooms usually have 30-70% of classroom time dedicated to online learning with the balance being heads-up learning. The KONGcart Bundle is an ideal presentation solution for the Blended Classroom, fitting school budgets where 1-to-1 purchases are complimenting other classroom hardware. The KONGcart Bundle has several equipment options, but the mid-range Bundle package runs 65% less than a comparable interactive white board set-up and 41% less than the cost of installing equipment in the ceiling. In addition to the value proposition KONGcart Bundles offer compared to ceiling or wall mounted systems, since KONGcarts are mobile, they can be shared between classrooms. Although a tablet computer is not included in the Bundle, a universal tablet stand is a Bundle option. This stand helps any tablet go into document camera mode and with the free APP that comes with the Casio Laser LED projector, or one of the many apps currently available, the tablet can serve as an interactive device that frees the teacher from the front of the room and incorporates most of the features of an interactive white board for a fraction of the cost. Another feature of the KONGcart Bundle is the ability to direct the LED projector onto any wall with ease. This facilitates small group learning in a way that ceiling or wall mounted projectors, or large screen monitors cannot. In my 15 years at the district level, as the supervisor of instructional technology, I’ve evaluated many technology tools, some have been welcomed into our classrooms others have not mainly because they have not met the above criteria. For technology to become a beneficial tool in education there must first be a vision for how it will be utilized within the parameters of the daily classroom routine. Teachers will need to be exposed to new technologies and then decide on how it can support their instructional goals. In addition, for technology to become successful and sought after in the classroom, it must be easy to setup, use and maintain and be available for the classroom teacher on a daily basis preferably as a permanent fixture in the classroom. Teachers, for the most part, will only use technology they feel comfortable using in front of their students and the time they will allow to gain this comfort level is relatively short. In my experience, if a teacher is unable to use new technology successfully on the first or second attempt, there is a good chance it will never be used. The point at which a teacher and their students become familiar with the use of technology is the threshold to which that technology reaches its true potential and utilization. Beside the above criteria, other factors to consider when evaluating technology for instructional use, would include; can it be secured (locked down), is it portable, does the manufacture or installer offer training on how to initially set it up and get it running, is there technical support and spare parts available (replacement lamps, batteries. ETC.)? Does the school or district offer staff development on how to integrate this technology with the current curriculum? Whether it be a document camera, projector, interactive whiteboard, science probe, computer with Internet connectivity, or a tablet/slate type device, as long as it meets the above criteria then it has a good chance of becoming an essential tool for enhancing the teaching and learning process. If the technology fails to meet the criteria it will be endanger of becoming an expensive experiment relegated to a dusty corner of the classroom. One of the biggest challenges in the use of this new technology was security and mounting. The cost to ceiling mount a single projector in our older classrooms was going to cost well over the price paid for both the document camera and projector combined. The solution found was a very nice product offered by GORILLAdigital, the “KONGcart 2000 Series”. 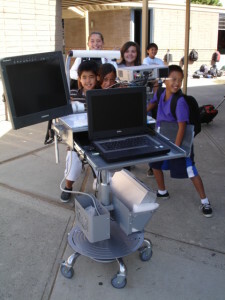 This stand has allowed schools to combine the most popular technology tools (document camera, projector and computer) on a single lock down metal cart. 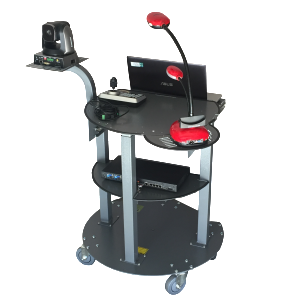 The KONGcart, with its large caster type wheels, easily moves from room to room or within a room and keeps all of the presentation equipment assessable to the teacher for a nominal $499 versus the $1500+ cost of ceiling mounting a projector. It is an adaptable and universal product for a changing educational environment and will be able to adapt to something new no matter what technology brings. For example, KONGcarts can now come with an accessory for iPads that makes them work like document cameras. The next wave of technology is moving towards a wireless classroom where teachers will be untethered from standing in front of the class while teaching their curriculum. Wireless tablets and interactive apps give teachers the freedom they need to teach from any location in their room. To be successful, I believe teachers must first get the attention of their students, the days of turning a back to a classroom full of students to write on a chalk board are over. Today’s students are visual learners, teachers must find new and creative methods of presenting instructional content that will excite and involve their students, technology has done a pretty good job of helping teachers accomplish this. Over the years vendors and manufactures have asked me to describe what teachers are looking for in the technology they use in the classroom, my answer has always been, make it affordable, durable and very easy to use. Mark Mariola taught biology, chemistry & physics at Garden Grove High School for 15 years and served in the district office of technology for 15 years. Top sales exec for a national av reseller says the KONGcart does it all. The pull out shelves on most carts are where teacher materials, doc cam, or projector would be placed. Those shelves, however, aren’t very safe locations for the doc cam nor for the projector to rest when moving from room to room. Also, those items aren’t ‘secured’ (or ‘tied down’) to the cart without the expense of extra cablelock/security kits. But most importantly, the placement of the projector on other carts makes it difficult for the teacher to face the students and project to the rear, when teachers try this with other carts their shoulders block the image or they get glare in their eyes. The KONGcart’s off-center projector mount makes a big difference in this regard. You will find that those carts have a larger overall footprint than the KONGcart by GORILLAdigital especially when you compare a round cart to a rectangular one. None of the other carts made by the other manufacturers are round. Most of those are knock-offs of their older carts which were intended either just for a projector and laptop, or for an overhead transparency projector. The addition of the document camera or tablet and the related need for a location to put teacher materials is an afterthought and none of these other manufacturers have put a lot of real effort into designing a cart which effectively houses all four elements. The beauty of a round cart is that you can rotate it so the instructor can stand behind the cart, to the side of the cart, or in front, depending upon how the projector position/direction is desired. The projector platform can rotate along with the cart so that the projector can always project onto the screen no matter where the teacher is in relation. A rectangular cart will take up more space in the front of the classroom. Security features protect the equipment, while the KONGcart’s rugged design and mobility make it convenient for daily use. The KONGcart has a small footprint, yet it provides a large work surface and a secure laptop drawer. An innovative arm provides 360-degree rotation of the projector, so teachers can use any wall in the class and can switch from one wall to another in seconds. KONGcarts are height adjustable, so they can be easily configured on site for a wide range of users — from pre-Kindergarten to high school classes. The height range of 29” to 41” also lets teachers use the equipment either seated or standing. 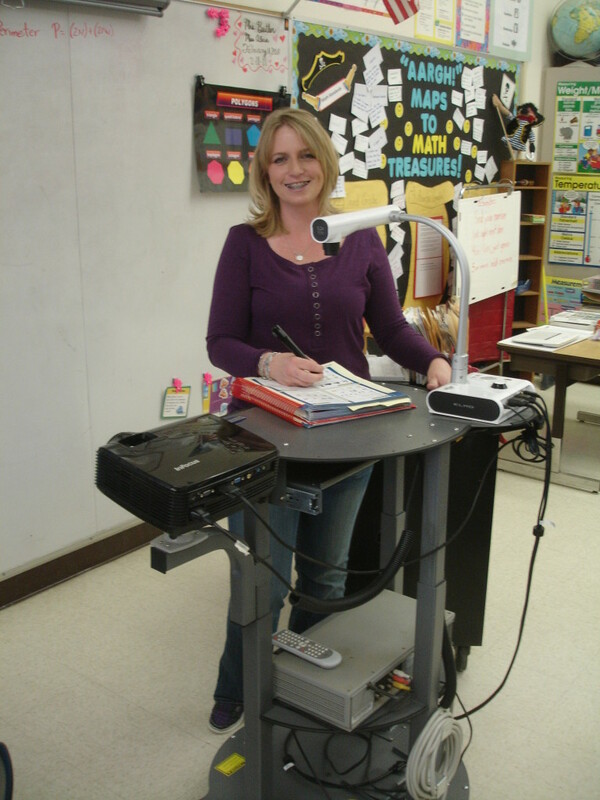 “The security cart has been wonderful to use with the document camera, because I can move it around in all different directions, heights and angles for my students to see better, and get better use,” said first-grade teacher Sabrina Duffy of Arovista Elementary School in Brea. The most obvious advantage of the KONGcart bundle program is its cost savings. It would cost around $50,000 to equip a 25-classroom school with KONGcart bundles, as opposed to $100,000+ for permanent, fixed installation of digital media equipment. KONGcarts and digital equipment can be installed in a typical school in just two days – a recent installation in San Leandro High School in California of 92 KONGcarts and equipment took two days. “We like the way the KONGcart mounts all our equipment, so teachers have ready access to projectors, document cameras and laptops,” explained Mark Mariola, technology director for Garden Grove Unified School District, which has KONGcarts in use at more than 65 schools. “Using this new technology enhanced the way I could communicate … in a way I never could have dreamed possible,” said Pattie Romero, a teacher at Arovista Elementary School in Brea. Educators who have used the system agree that the ease of use and versatility of the KONGcart has helped make digital media an integral part of the classroom experience. “With the introduction of tablets and chromebooks into the classroom, my KONGcart is the perfect way to conduct heads-up learning and the ability to move the projector to any wall lets me teach in small group settings very well,” said Harry Blaker, a fifth-grade teacher at Stevens Creek Elementary in Cupertino (Calif.) — one of 15 schools in Cupertino Union School District where KONGcarts are in use. Catherine Cabiness, a teacher at James Irvine Intermediate School in Garden Grove, said she appreciates the speed at which she is able to switch from the KONGcart’s document camera to the laptop — in a matter of seconds. “This adds (impact) to my instruction, because we can take notes on the big screen and then quickly switch over to a QuickTime movie for visual effects. The students seem to like the new technology, as well. KONGcarts are available on GORILLAdigital’s web site or through B&H and other AV dealers. For more details about the KONGcart and tablet accessories contact GORILLAdigital at (800) 880-3988 ext. 302 or visit www.goapedigital.com.